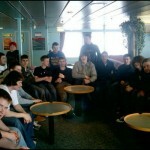 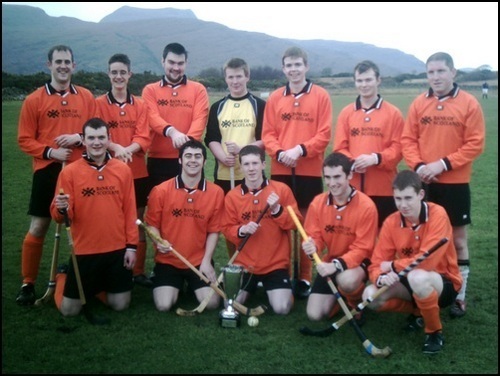 The 21st of February 2007 marked the first ever game by an adult team from Lewis & Harris on the mainland. 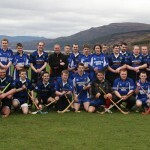 Held at the shinty park in Morefield, the newly re-constituted Camanachd Leòdhais took on North Division Three Lochbroom for a trophy donated by Sean MacLeod, the Cuach a’ Chuain Sgith (Minch Cup). 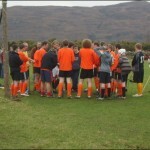 Lewis lined up in orange strips borrowed from the Nicolson Institute. 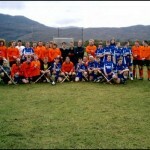 The match remained at 1-0 at half time, but the Broom took advantage of changes in the Leòdhasach team to win the inaugural fixture 7-0. 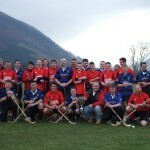 There were several Cuach a’ Chuain Sgith games held in the intervening years, with Lewis gaining closer all the time but never quite winning the trophy. 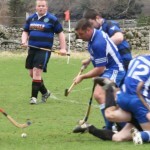 Sadly the Cuach a’ Chuain Sgith hasn’t been played since 2013 with Lochbroom folding after the 2014 season. 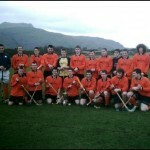 Hopefully the Broom will come back at some point whilst the trophy resides in the Morefield Motel and will hopefully be played for in the future.